Student's truck in the College of the Redwoods Parking Lot. 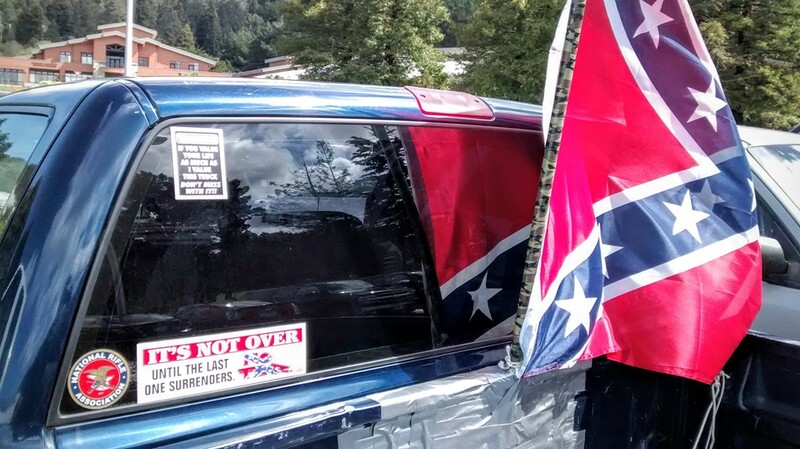 Although Confederate flags do appear on the occasional barn wall, truck bumper or window, Humboldt County had no real role in the Southern cause. But the War of the States did have a marked effect on the Redwood Coast, according to Humboldt State University history professor Thomas Mays. “During the war, Humboldt was like a lot of frontier areas in the United States; the U.S. stopped garrisoning frontier posts, and some of the largest Native American fights took place,” he says. When the troops left Fort Humboldt, local tribes saw an opportunity to reclaim their indigenous land and began escalating violence against white settlers. This drew a weighty and horrific response from vigilante groups. Kinman, who is suspected of participating in the 1860 massacre of Wiyot women and children on Indian Island, was one of many locals who took part in routine massacres and “round ups” of Native Americans during and after the Civil War. Those not killed were pressed into slavery, exposed to infectious disease or marched to reservations far away from their tribal lands. Landmarks in our region bear the names of men who participated in this genocide. Larabee Valley, for example, is named for Henry Larabee, who once boasted of having “killed sixty infants with his own hatchet.” The Kelsey Recreation Trail, in the Marble Mountains, bears the name of Ben Kelsey, who slaughtered Native Americans as part of the Sonoma Gang before becoming a founder of Arcata. When a society is structured in a way to systematically advantage one group over another, this is known as systemic racism. The philosophy of Manifest Destiny and blunt dehumanization used to justify the genocide of Native Americans on the North Coast are blatant examples of systemic racism, but other forms still exist, in our schools, our jails and public institutions. The American Civil Liberties Union of Northern California and the National Center for Youth Law recently brought a lawsuit against Eureka City Schools, alleging racial and sexual discrimination against African American and Native American students. An investigation into the allegations and a subsequent study reveal that students of color were disproportionately disciplined for minor infractions and shunted into non-college-track courses. In March 2014 the City of Eureka retracted a draft letter of apology to the Wiyot tribe for the Indian Island massacre. City officials felt that the original letter, which acknowledged the participation by Eureka citizenry in the massacre and offered a formal apology for a “massacre of unfathomable proportions," might expose the city to litigation, a fear that appears to be unfounded. A second letter, vague in language, was proffered instead. Although Native Americans make up just 6 percent of Humboldt’s overall population, they account for 17 percent of those suffering housing insecurity, according to a recent draft report from the Humboldt Housing and Homeless Coalition. Both Native American and African American children are disproportionately represented in the child welfare system. Still, leaders in the African American and Native American communities say that strides are being made. Today, Powell says that the organization is focused on political action. Chag Lowry, program manager for the Native Cultures Fund at the Humboldt Area Foundation, says media focus on the problems rather than the solutions is a common, unacknowledged example of systemic racism. The relative youth of most tribal governments, the inherited trauma of the boarding school system, the lack of native voices in Humboldt State University’s administration, all of these could be considered examples of systemic racism, according to Lowry. The True North Community Organizing Network, which is also under the umbrella of the Humboldt Area Foundation, recently hired a native community organizer. Local tribes are involved in providing social services for their members, care for children and elders, education outreach, language revitalization services, environmental oversight and cultural events. Lowry says these important aspects of contemporary tribal life are often underrepresented by the media. On July 10, South Carolina lowered the Confederate flag for the final time in the state’s capital, turning the controversial piece of cloth over to a state history museum. The flag had gained national attention after the shooting of Charleston churchgoers Rev. Clementa Pinckney, Tywanza Sanders, Cynthia Hurd, Rev. Sharonda Coleman-Singleton, Myra Thompson, Ethel Lance, Rev. Daniel Simmons, Rev. DePayne Middleton-Doctor and Susie Jackson by a self-proclaimed white supremacist. 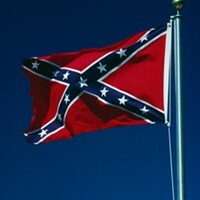 Discussion of the Confederate flag on the Journal’s own website and Facebook page generated a hefty amount of criticism on both sides, with some readers emphasizing heritage and others hatred. The flag, say many, is just a symbol. Yes, say others, but what it symbolizes is worthy of a critical eye. It remains to be seen if that same critical eye will be applied to the our own legacy of slavery, genocide and racism, a legacy that has no stars and bars to point at, no banner to wave nor to lower. EDITOR'S NOTE: The original post stated that the City of Fortuna does not celebrate Martin Luther King Jr. Day. A city employee emailed to say as of July 1, 2015 this had changed.